​"You Can't Stop the Beat" from Hairspray at this years 16th Annual Tommy Tune Awards. "When six well-intentioned actors gather to rehearse a presentation about a historical tragedy, they slip from joking comradery into conflict as they confront their own hidden fears. How do you tell a story when only one side survived to leave a record? With surprising humor and a deep sense of empathy, We Are Proud to Present... asks fearless questions about race, history and the power of theatre." Panto Cinderella is a rollicking, wild retelling of the Cinderella story is sure to liven up this holiday season. If you think you know the story of Cinderella, her fairy godmother, her prince, and step-sisters…think again. 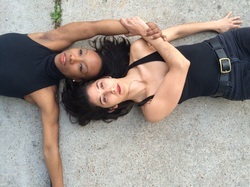 The METdance Company will perform Paralyzed by Fear choreographed by Courtney D. Jones in their 22nd Season Performance of Where The Heart Is. The Dance Gallery Festival will present Paralyzed by Fear, choreographed by Courtney D. Jones and performed by the METdance Company. Ten Tiny Dances asks dancers/choreographers to make work or a 4’ x 4’ stage. Courtney led a post screening discussion and q & a following the showing the independent film "MA", by acclaimed director and choreographer Celia Rowlson-Hall. ...and though she be but little. at The Barn – Dance Source Performing Arts Space. Unrefined is a pop up dance performance that will take place at SUGA Art Gallery. The evening will include a performance by Laura Gutierrez and Courtney D. Jones, which is inspired by the music of various pop culture artists, the artwork, layout and location of the newly opened SUGA Art Gallery which specializes in Contemporary Latin - American Art. DanceNOW features fresh voices from a new generation of dance makers. The evening offers up a stylistic cornucopia with something for everyone! Called Back, a trio by Houston favorite Hope Stone Dance, is a commemoration of key moments in the sometimes ebullient, sometimes apathetic journey of life.